The beginning of October has regularly been the time for Oak Knoll Books, (in New Castle, Delaware, USA) to host a Fest . . . for those of us who produce books to meet with librarians, collectors and local book lovers in the wonderfully relaxed early autumn sunshine to talk about, handle, admire and acquire the most recently produced books. The bookshop itself has several floors of wonderful collections and it is open all weekend offering amazing discounts. There are talks and discussions held in various parts of the historic town where William Penn first landed in America and, especially, there is a hall filled with tables each manned by one or more of the creators of the books on sale. The Old Stile Press has travelled over there for many years now – and we always relish the opportunity to meet again those of our US collectors who visit and, each time, there are new people to whom books from the UK are unfamiliar. When I say The Old Stile Press . . . that usually means Frances since Nicolas does not take much pleasure in travelling and he would rather be at home printing another book! 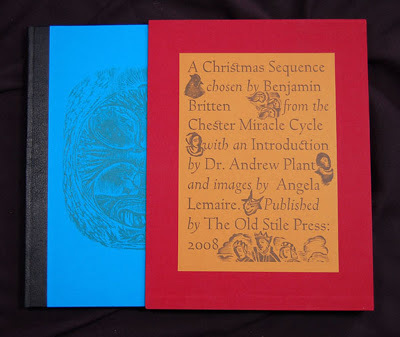 So this October F. will collect up some books – especially of course the newest (A Christmas Sequence – see photographs above) and we hope that it will create an excitement similar to that on this side of the Atlantic. 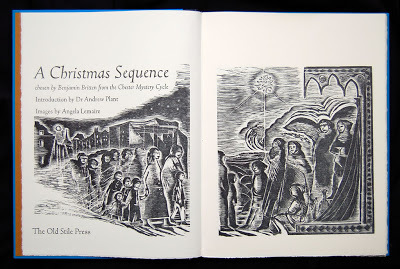 Meanwhile, Nicolas will continue to print George Mackay Brown’s ‘play for voices’ – A Girl from the Sea. This progresses excitingly. 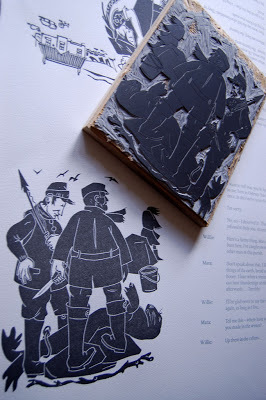 The text is printed and now the woodblocks engraved and cut by Michael Onken in Carbondale, Illinois are creating the images of Orcadian life, seals on the shore line and a croft which gradually rings to the sound of children playing. 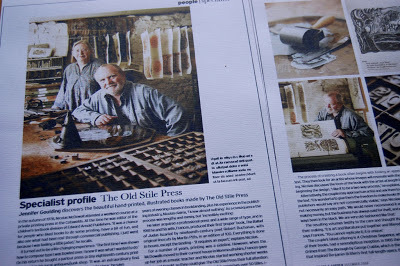 The December issue of House and Garden is using its specialist profile page to talk about The Old Stile Press. Jennifer Goulding has written enthusiastically about what we do and aspects of the printing office were beautifully photographed by Andrew Montgomery who makes it look wonderfully atmospheric and ‘old world’! Andrew kindly said that we could use some of the photographs in blogs and such . . . so watch this space! This photograph is of some proofs of the two-page article. Jennifer Goulding thinks our books are ‘a delicious secret for the privileged few’. We would be very happy if a few more folk could be introduced to the delicious secret!